The master cylinder is the heart of your vehicle’s braking system, and it holds the brake fluid when it is not being delivered to the brakes through the brake lines. If brake fluid leaks because the master cylinder is worn or brake lines are plugged or broken, the fluid cannot be delivered, and the brake pads will become ruined. When Ponte's AutoCare inspects your brakes, we will make sure the master cylinder is in good condition. The brake fluid itself can become dirty or contaminated as it draws rust-causing moisture and picks up other debris, or it can break down from excess heat. 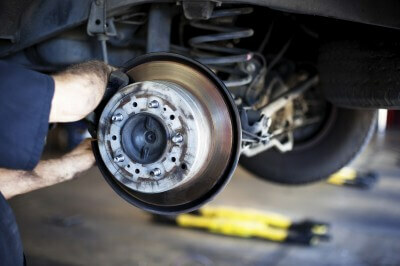 Clean brake fluid is either clear or slightly yellow while dirty brake fluid may be brown or even black. Old and dirty brake fluid can damage brake systems internally. During your brake inspection at Ponte's AutoCare, we will check your brake fluid to make sure it is clean. The brake lines connect to the master cylinder through a combination valve, which combines metering and proportioning valves. It regulates the pressure on the front and rear wheels to make sure both sets of brakes are applied simultaneously. A malfunctioning combination valve can cause the wheels to lock up. To ensure your safety, the experts at Ponte's AutoCare will make sure your vehicle’s combination valve is working properly.